Going above and beyond with holiday decorations may not be an exclusively Southern tradition, but it’s certainly one where we strive for excellence. Among Southern locales, Asheville’s Biltmore Estate takes the cake (coconut, naturally) when it comes to dazzling visitors with twinkling lights and garland by the thousands of feet. 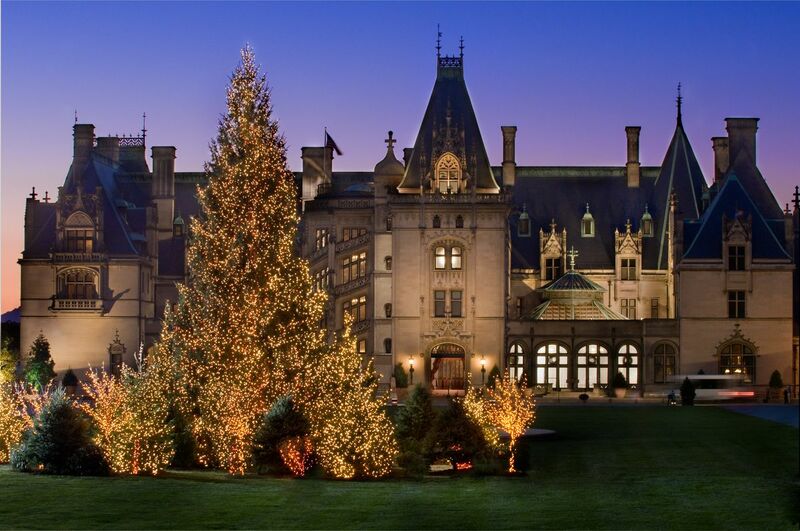 The sprawling property, which includes a winery, Antler Hill Village, and The Inn on Biltmore Estate, is astonishing during the other ten months of the year, but November through early January, the Christmas at Biltmore celebration is an even more special time. Perhaps that’s because the house didn’t formally receive guests until Christmas Eve, 1895, though George Vanderbilt had moved in in October of that year. LeeAnn Donnelly, who is working her tenth holiday season at the Biltmore, walked G&G through the preparation behind getting America’s largest home ready and gave us the numerical rundown on what it takes to pull off such a famously festive display of cheer. The library at the Biltmore. Christmas comes early at the Biltmore. The next time someone accuses you of jumping the gun with putting up your tree too soon, tell them that’s how they do it at one of the grandest houses in America. Installation of Christmas at Biltmore gets going in late September, starting with the 7,000 globe-shaped ornaments hung from the ceiling of the Winery Tasting Room. Inside the house, preparation work commences at the same time, although decoration doesn’t begin until the first week of October. At the helm of the decorating charge this year was Lizzie Borchers, the estate’s floral manager. Succeeding Cathy Barnhardt, who retired in 2017 after 40 years of planning Christmas celebrations, Borchers led a team of ten full-time designers. As for next year? “It’s already in the works,” Donnelly says. The Front Lawn tree stands 55 feet tall. More than 300,000 guests visit the Biltmore during November and December. Think of that as if the entire population of Greensboro, North Carolina, or Orlando, Florida, made its way to Asheville and merged upon the estate’s property. Accordingly, if you plan on visiting during peak Christmas hours, Saturday and Sundays, allow plenty of time for your visit; the traffic and ticket lines tend to be long. 7,527 feet of fresh evergreen garland was used this season. To put that in Southern terms: It’s the length of nearly 21 football fields of mixed white pine and Fraser fir. The Winter Garden in Biltmore House greets guests as soon as they enter. This year, you can find 55 decorated Christmas trees in Biltmore House, plus another 58 at locations across the estate. One of those trees—always the tallest of the bunch in the house in a true Vanderbilt tradition—resides in the Banquet Hall. The tree hails from Andrews Nursery in Newland, North Carolina, a farm that has been providing the Banquet Hall tree for more than 30 years. It measures around 35 feet tall. Antler Hill Village at night. Before entering the house, guests are welcomed by the 55-foot-tall Front Lawn tree, illuminated by 46,000 lights. Compare that to the 500 lights needed to adorn the average-sized 7-foot tree. Finally, no Christmas tree is complete without ornaments, though decorations in the Vanderbilts’ day were much simpler (at that time, only 20 percent of Americans celebrated the holidays with a tree). Five-hundred ornaments can be found dangling from the Banquet Hall Tree, and another 13,000 are hung on the 54 other trees inside the house. The oldest baubles, carved wax ornaments, are only 30 years old—the original Vanderbilt ornaments would have been “too fragile to survive the years,” Donnelly says. The Tapestry Gallery in Biltmore House.